This Saturday, teachers are rallying in Washington, DC. Save Our Schools is being organized by teachers and other public school supporters who view federal policies such as No Child Left Behind and Race To The Top as the wrong approach to educational reform, arguing that they rely too heavily on standardized test scores and punitive measures for schools that don’t make the grade. Save our Schools’ website calls for more equitable funding for schools, and more opportunities for classroom teachers and parents to influence decision-making, from developing lesson plans to shaping national policies. Matt Damon, who recently narrated The American Teacher documentary, will be speaking. 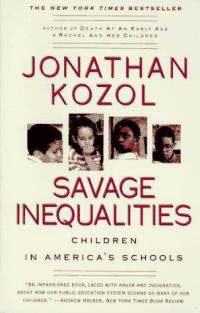 So will Jonathan Kozol, former teacher, civil rights activist, and author of Savage Inequalities and other influential books on economic and racial inequities in American schools. I haven’t heard much from Kozol since he published The Shame of the Nation: The Restoration of Apartheid Schooling in America in 2005. So it was interesting to see his thoughts on the state of public education in an interview with Anthony Cody, a former teacher and one of the rally’s organizers, on the Education Week site. Kozol thinks that No Child Left Behind is creating two classes of citizens: Those in low-income schools who are taught to “to spit up predigested answers,” and those in affluent schools who are taught to ask insightful questions, demand things, and make decisions. Kozol believes that racial segregation in the nation’s schools is worse than when he started advocating against it as an activist in 1968. Here are a few highlights of his views on the state of education today and the latest efforts to reform it. The inequalities are greater now than in ’92. Some states have equalized per-pupil spending but they set the “equal level” very low, so that wealthy districts simply raise extra money privately. […] The system is more savage now than ever. Our Secretary of Education, Arne Duncan, is fond of saying that “Education is the civil rights issue of our time.” Is he right about that? […] He [Duncan] doesn’t lift a finger to address the glaring fact that public schools for black and Latino kids from coast to coast are now more wildly and shamefully segregated than in any year since 1968. I walk into high schools, with as many as 3,000 students, from Chicago to Los Angeles, from Dallas to Miami, from Denver to New York, and in an entire day I might see ten white students. […] Separate and unequal didn’t work 100 years ago. It will not work today. And anyone like Duncan who attempts to tell us otherwise is guilty of historical myopia. Read the full interview with Kozol here.